There are three variations to this passing station. The first variation players skate at the player in front of them making one-time passes to each other. Encourage players to not slap at the puck but have soft hand and receive and pass. 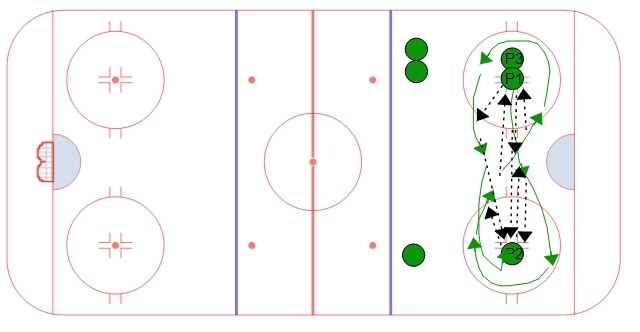 The next variation players do a control turn around the player while receiving hte puck back, then they make give and go passes on their way back to the other player. The thrid variation has the players make a pass and then open up to receive the pass back. The animations tell the story much better than the diagrams for this drill.